On corresponding – For the fainthearted . . . There was a feeling of delight in sitting and writing a postcard. It wasn’t a very interesting postcard, nor would the words signify much to anyone other than the person to whom it was addressed (other than, perhaps, suggesting the writer was eccentric), but there was nevertheless a certain pleasure in writing it. Having poor cursive handwriting, I print, using a black cartridge pen given to me as a leaving present by a friend in my last parish. Writing with the pen is a pleasant sensation, it would almost be possible to imagine that the words were of some importance , the pen having a feeling of gravitas with its black body and gold nib. 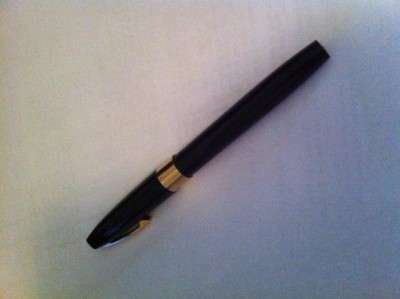 It was not hard to imagine that great people may once have written with such a pen. The stamps went up in price recently, but their cost is almost negligible when one considers that such a stamp will carry correspondence around the world. Once the stamp had been affixed, a blue “aerphost” sticker was attached and the card was ready for posting. Cross-channel postage has become very slow, two to three days having become the norm for post from Britain. Being eccentric and feeling the postcard was important, for me, if for no-one else, I drove to the sorting office at the edge of the town to ensure that the postcard caught the evening collection and might have a prospect of reaching its intended recipient before the weekend . A green utilitarian postbox stoood outside the building, a notice on it said the last collection was at 5.40 pm, in fact, the only collection shown was at 5.40 pm. Sending a postcard was not an act of great significance, the person to whom it was sent will probably think it an idiosyncratic thing to have done, but there was probably something in that card that represented a yearning for former ways, for times when a letter arriving on the doormat would have been a moment of excitement. Social media are wonderful, but there has been a loss of the deeply personal dimension. Experts are said to be able to determine a person’s entire personality from analysis of the person’s handwriting. Even if one knows nothing of such things, seeing words written by a person with their own hand bring them close, speak of the mood in which they had chosen their words. A hard-headed person would discard the postcard having read it, otherwise it becomes clutter, taking space on a surface somewhere. A soft-hearted person might wish to retain it as a memento of these times. In fifty years time, when there are no letters and no cards anymore, what legacy will people leave in terms of correspondence, if we never put pen to paper, then what will there be for succeeding generations to read? And what of significant people, if there are no letters and papers, to what will people return for a real biography?